We said bring Lemons and we got Richard Simmons!! 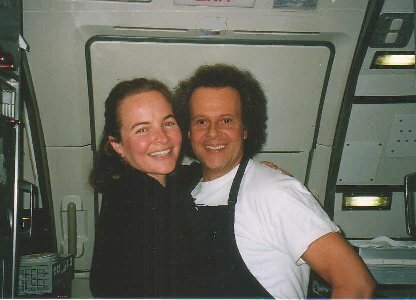 I had Richard Simmons on my Flight from Philly to LAX. He was a hoot. He came onto the plane and gave us each a kiss and said that he was working the flight with us. Then he proceeded to do just that!! And of course we let him :-) He was wearing his trade-mark little shorts and a t-shirt and one non-reving F/A let him borrow her apron. I was the galley girl in First Class, so I made all the drinks and food and stuff, but he was out there in the first class cabin taking the orders and delivering everything. Then he helped out in coach by passing around the pretzels to everyone. When a little boy threw up in the aisle after some turbulence, he even helped clean that up!! He may be a weird little man, but he was a real sweetie. He had a first class seat, but he only sat down for take-off and landing. He was up and working with us the whole flight. He said that that is how he keeps the weight off—by staying active. The man is definitely attention deficit!! We heard all about his life, his house and his dogs (dalmations) and how much he travels (over 300 days a year!). He concentrates mainly on the really really obese people. Giving aerobic classes in Nursing homes and hospitals and to homebound people. And he is on QVC and the HomeShopping network quite a bit. He was joking and saying things to passengers that we would never get away with...One man was rubbing his belly and saying that he needed Simmons help with his weight. Richard told him not to touch himself in front of the other passengers! All in all, he really wore us out. He would take orders and then forget where they went. (We had a full first class cabin with 26 folks on the Airbus 321) The Lead flight attendant followed him around as he took the meal orders and stuff to try and maintain some organization.